the annual london design festival in september welcomed a citywide celebration of design. set across six different flavoured design districts, the capital hosted over 300 individual events in the form of exhibitions, shows, workshops and countless product launches. the london creative community opens its doors and streets for 9 days and its a perfect opportunity to see the latest design trends. last year, i was part of deVOL’s exhibition team at 100% design. this time around i was free to roam the city for 48 hours to soak up the atmosphere. seeing as much of the festival in under two days without much time, planning or oyster credit is a bit of a stretch. i know you get the most rewards from smaller, intimate venues but i thought it was best to visit the three biggest trade fairs happening in the city: 100% design, designjunction and tent & super brands london. combined, these shows attract a powerful lineup of products and brands from the UK and across the globe. 100% design is the largest design trade event in the UK and welcomes over 28,000 visitors to earls courts. the show is split into 4 key zones: kitchens & bathrooms, interiors, workplace and eco design + build. on display are mostly large, expensive stands from well-established companies. however, a few emerging designers and studios are dotted in the smaller corridors between areas. an international pavilion, workshops, stage talks and student showcases round off the show and provide a bit more engagement and variety. this year the exhibition celebrates its 20th edition and was launched in style by designer philippe starck. the show has certainly transformed in the last couple of years as new owners set to refocus on big names, brands and an overall increase in quality. i was excited to finally get up close to the concept kitchen by kilian schindler for naber. this kitchen range centers around a steel frame skeleton that can be configured to suit every type of kitchen task. a low level module can become a sink area or prep station. a taller module can be turned into an appliance cabinet or a simple rack of shelves. you can be creative with the modules and arrange a few to suit your cooking habits. it feels like a giant meccano set for your kitchen but the materials and construction on the modules is superb and the curves and mesh details aim to soften the industrial theme. its a fresh, alternative take on the modern free-standing kitchen and it can effectively turn any space into an adaptable cooking environment. last years farm kitchen was one of my highlights of 100% design 2013. mette creates returns this year with another fantastic installation – the maker carousel. visitors are invited to get hand-on in a series of workshops within a unique makerspace environment. each arm showcased a different design discipline from traditional handpainting to modern 3d printers. the space highlighted how a diverse range of practices are woven together and contribute to the overall creative process. this may seem all too familiar to designers like myself but it gave a perfect snapshot of what it’s like to be a designer right now. what will the maker carousel look like in 10-15 years time? ‘brick’ from amsterdam-based leff is a modern reinvention of the retro flip clock. the copper/black model is the most impressive and would look great on an office desk. overall i enjoyed 100% design but despite the refocused efforts on quality its still a bit hit and miss. the scale of the show makes it feel quite intimidating and there’s a lot that doesn’t feel relevant or exciting. the old sorting office in central london provides a gritty, industrial backdrop for designjunction. now in its 4th year, it has gained a reputation for offering an alternative experience to the design trade show. designjunction is a complete maze spread across 4 floors. it has a heavy focus on individual talent and showcases a lot of new local designers, start ups, artists and craftsman. the bottom floor has a marketplace with streets of cosy stands. above that are two more floors with more established brands and international designers however the amount of flash is kept to a minimum. 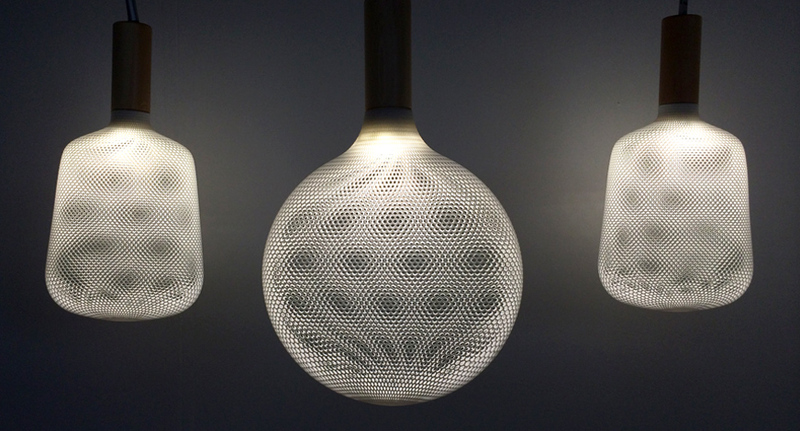 a growing lighting sector has meant the creation of its own dedicated space at designjunction. located in the basement of the sorting office is ‘lightjunction’ a dark, closed-off environment for anything that illuminates. as you walk down the vehicle access ramps inside the building you encountered this beautiful array of 2,700 oled discs from french lighting company BlackBody. taking great photos in the dark on your phone is difficult if you have no idea what youre doing so unfortunately i can’t share any photos of lightjunction. (the photos were pretty awful) however, it was a great addition to the main show and the damp underground of the sorting office was the perfect space to interact with light and colour. i admire the work of oree and i’ve wanted to get hands-on with their wooden computer keyboard for some time now. ‘board’ is made from a single piece of maple or walnut with the grain location left intact. each piece is unique and you can engrave different illustrations and fonts if you want to but the real quality is in exposing the wood as best as possible. of course, it won’t hold up in an office environment where fingerprints and coffee spills are a regular occurrence. but the texture of the grain feels a lot warmer than the artificial surfacing you can get on plastic office keyboards. it makes the act of typing quite pleasurable and adds a softer, calming nature to using a computer. the british design brand vitamin still produce their urban gnomes that loomed over me during my placement interview at the studio many years ago. recently the homewares side of the company have spun off from the main consultancy and started producing a distinct range of ornaments, vases and pendant lights. this was expanded further at the show with the launch of their eclipse table (above), storage jars, cone hooks, an asymmetric stool + others. what i like about vitamins style is that it is distinctly simple and modern but built around a traditional use of materials. in addition, the studio is swamped by industrial design interns from loughborough design school and it was great to chat to them about their placement experience. 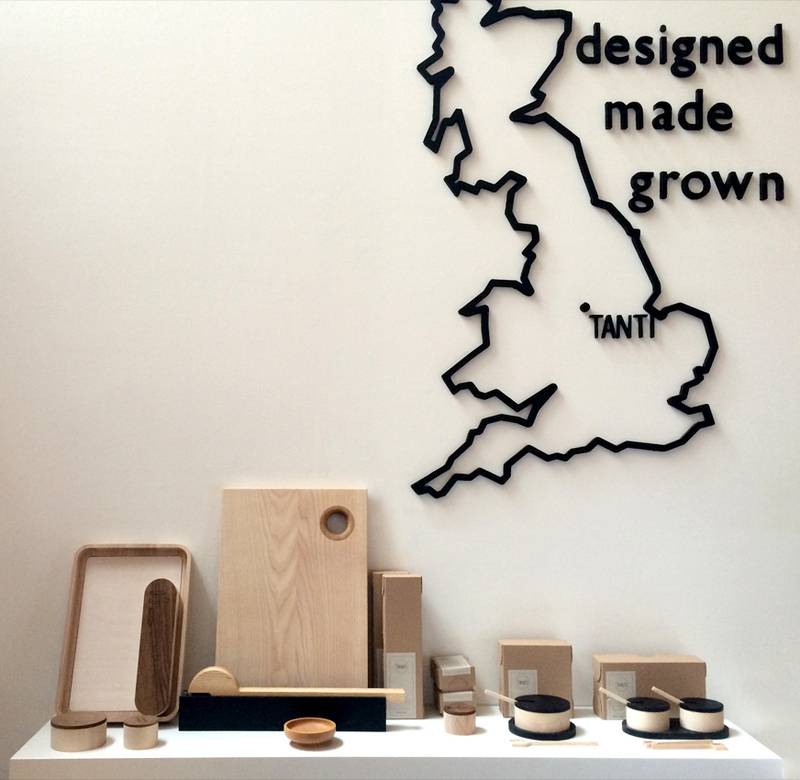 tucked away in a quiet corner of designjunction was tanti design and their range of beautifully worked wooden furniture and homewares. they had a great combination of ash, walnut and oak designs that were spliced and combined with magnets and laser engravings. i was drawn to their map of great britain and found out they are based just down the road in leicester. the lead designer explained their eco-friendly aims by using sustainably sourced british wood and championing emerging green technologies. my highlight from the festival is a pen. ajoto was built from the ground up to be the ultimate instrument for designers, writers and doodlers. it was incredible to use. the cartridge itself is so fluid to write and sketch with and the ink is un-smudgeable. the pens come in aluminium and brass cases and house some beautifully machined components. it’s not just about looks, the weighting, feel and interaction with the pen right down to surface details and chamfers have all been considered. it all adds up to a remarkable object. i had a chat with co-founder chris about the design process of ajoto and the mechanisms involved in creating the ultimate pen. he even rummaged around behind the desk and brought out some early prototypes and ideas. as a product designer i love to see the development work as much as the finished article. after all that there was still time to grab an orange juice at the transport for london restaurant.’the general’ was commissioned to celebrate the year of the bus – there was a wall made from reclaimed vintage enamel bus stops, the menu was displayed on a dot matrix display and the benches were wonderfully finished in the tfl moquette designs. i needed a coffee and a sit down before my next stop further east in the city. my final visit was tent & superbrands london, two combined shows in the old truman brewery in shoreditch. tent exhibits small, independent designers, furniture makers and studios and provides a great platform to get the attention of retail buyers. there is a larger focus on textiles and contemporary design, given this is one of the more forward-thinking and creative parts of london. superbrands on the other hand is strictly for high-end studios and global design brands. its mostly for increasing market awareness and new product launches so all you do is walk around temporary showrooms.the high-end side of interiors isnt really my cup of tea so there wasn’t much for me to see and do at superbrands. with both shows there is a more international flavour. this year 100% norway and tokyo designers week were invited to take part. i loved the range of pots, pourers and bowls by leicestershire-based sue pryke. they are based on simple, functional forms and the coloured clays are naturally subtle. as each one is hand made there are very slight changes in form that really play with the colour and texture. heals launched the ambrose collection at superbrands, a range of furniture essentials designed for young home-owners in small city apartments. i can relate to this market quite well so i was very excited about seeing this range in person. the collection focuses on intelligent, freestanding designs that can be transported flat. it’s an interesting area to tackle, so much so that ikea have aimed their latest ps collection with this exact market in mind. unlike ikea, ambrose is not designed to be disposable and made from more substantial materials and fixings. as you can probably tell, i completely clicked with designjunction. it was the most enjoyable show by far for the range, organisation and quality of the products on show. the raw and gritty setting of the old sorting office is in itself a great asset to designjunction. it adds a nice contrast to the new products on show. ultimately, designjunction feels more than just a place to see things but a place to engage and talk to actual designers rather than sales people. i really look forward to next years london design festival and i will be able to set aside more time to explore it in greater detail. from 2015 i will now be living and working in london. i’ll see you there!